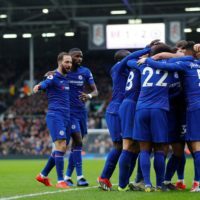 So maybe we did not get a full weekend of EPL football, but in return we had a bit of FA Cup football and a full midweek of European football. Wait that is not enough either? 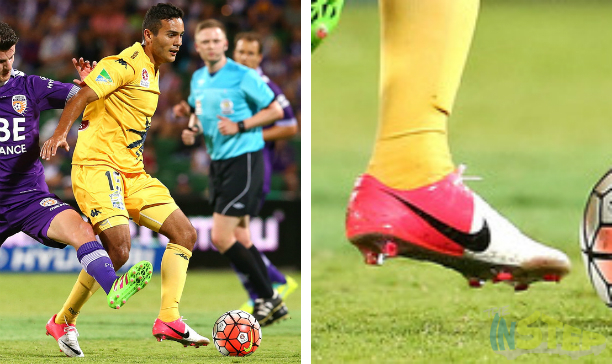 Well that is alright, it is a good thing we have your usual Monday boot spotting! The Instep has compiled the best boot spots from this week’s football action, and while our boot spotting this week does not have the usual megastars we normally have, the spots are definitely as interesting as they are every week. Check out what caught our eye this week. Between all the ACE 16 boots that have been realised, it seems the ACE 16+ Primeknit just about takes the cake as the most popular boot in the silo amongst the professionals. 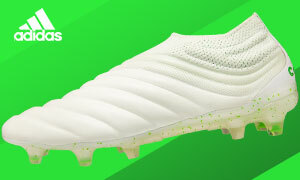 And who can blame them, you more or less get the modern cut of today’s football boots, but scaled down just a touch compared to the top of the line PureControl. Richard Foster has picked out what I think is the cleanest ACE 16+ boot to date, the White/Semi Solar Slime/Shock Blue colourway. Foster is the first we have seen in this colourway, with the release colourway far and away the most popular boot so far. 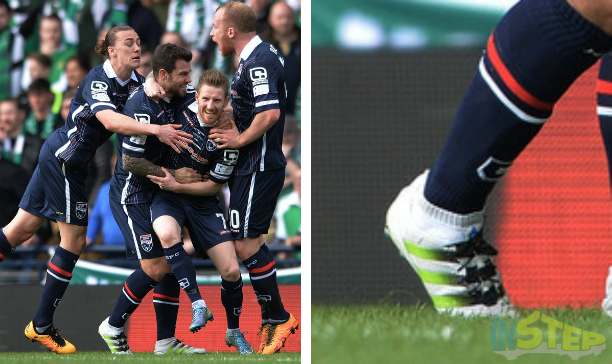 Think all professional footballer’s love the high life and the perks of top dollar sponsorship from the boot companies? 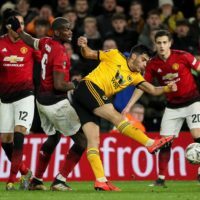 Not all of them it seems, Assou-Ekotto came out during the week saying he does not want to be helm of a company by being sponsored by them (I put it much more eloquently than he did) and that he buys his boots on the cheap from eBay. 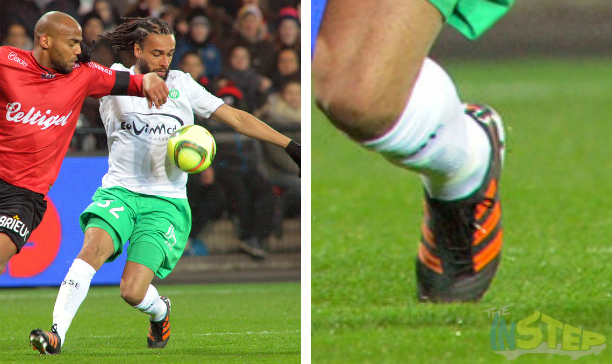 Predators seem to be the boot of favor for Assou-Ekotto, and he was seen this week in the classic Black/Warning Predator adiPower. That is not a boot name that flows off the tongue smoothly hey? While Diadora are arguably known for their comfortable leather boots, the DD-NA3 GLX 14 is the rarely seen speed boot released by the Italian company. 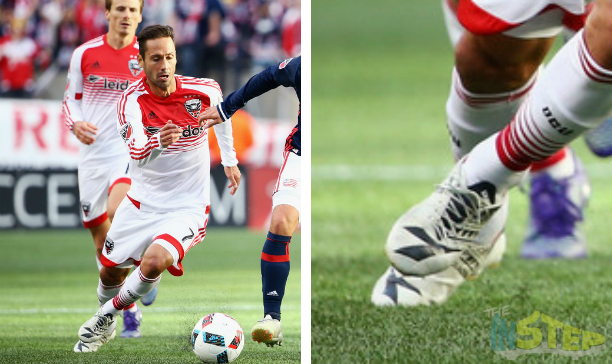 Featuring a synthetic upper with Diadora’s Special Touch Control Treatment, Marcelo Sarvas is one of the first we have seen in the boot, as his DC United drew 0-0 with New England in the MLS. Every year, we seem to have a boot company that more or less comes from no where and start producing quality football boots. In the past 12 minutes months or so, that company would be Under Armour. The Speedform has been at the center of Under Armour’s success, and we always love seeing players straying away from the pack and trying the quality boot. 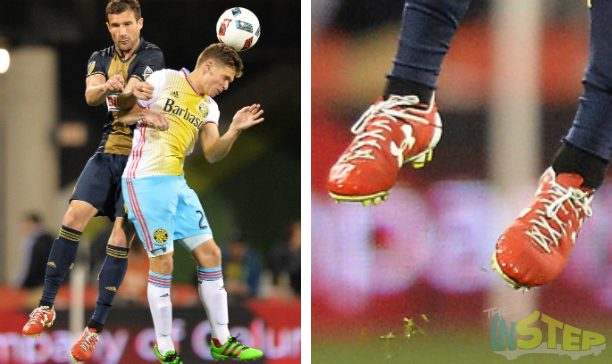 Chris Pontius has opted for the blazing red colourway of the Speedform, and also putting on some white laces to match the white UA logo. A sharp addition from the midfielder. The CTR360 Maestri II, what a top boot that was…while the Magista has certainly been a worthy successor to the CTR360, it is a boot definitely deserves a quick throwback to. And Timo Beermann (cracking name to have with St. Patricks Day coming up this week) has got arguably one of the finest CTR colourways ever released: the Dark Shadow/Volt CTR360 II. The CTR was the boot that championed Kanga-Lite, which in our eyes was definitely one of the game changing uppers that was introduced to the football boot world. 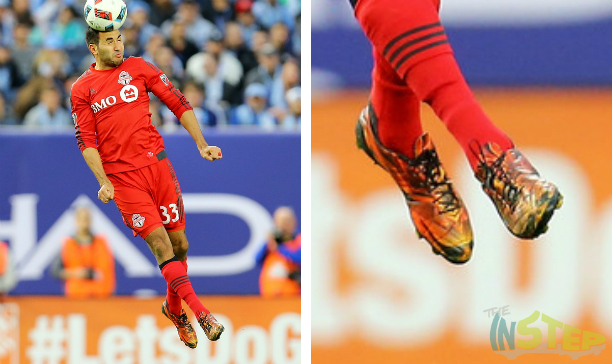 That is it for our boot spotting today, what was your favourite spot of the week? Share your thoughts in the comments section below.